Erythema nodosum leprosum (ENL) or Type-2 lepra reaction is a serious, difficult to manage immunological activity seen in intermediate borderline lepromatous and polar lepromatous leprosy. These cause the patient's huge sufferings as the condition persists more than years. ENL presents as multiple acute episodes or chronic. The main objectives in the management of ENL have focused on the control of inflammation, pain relief, and further prevention of episodes. Mild cases are treated with aspirin and paracetamol. In moderate and severe cases, the mainstay of treatment is the corticosteroids. The most commonly used corticosteroid is oral prednisolone. Steroid is started at the dose of 40–60 mg/day to a maximum of 1 mg/kg/body weight. The dose is tapered regularly with the improvement of symptoms up to 5 mg and stopped once a reaction subsides. The majority of patients require multiple courses of prednisolone due to the natural history of the disease. In steroid dependency or steroid-induced complications, clofazimine is used. Clofazimine is a dye acting both as an anti-inflammatory and as an antimicrobial agent. However, it has a slow onset of action. Clofazimine at a dose up to 300 mg daily can be given for control of ENL. This higher dose should not be continued for >12 months. The next important and highly effective drug is thalidomide. Thalidomide monotherapy or in combination with steroids is very effective in treating moderate-to-severe ENL cases. It has a rapid onset of action such as steroids. Its beneficial effect as anti-inflammatory is due to its anti-tumor-necrosis-factor (TNF) property. A 23-year-old male admitted for the management of Type-2 ENL reaction developed syncopal attack at early morning around 2 am when he went for passing urine. On examination, the patient was conscious and oriented with the blood pressure recording of 90/60 with pulse rate of approximately 46/min. 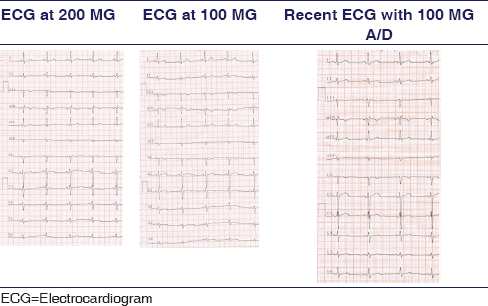 Emergency electrocardiogram (ECG) was taken [Table 1] and it shows sinus bradycardia of 46/min. The patient was managed with intravenous fluid normal saline initially, and regular monitoring of blood pressure and pulse were noted. There were no clinical symptoms such as giddiness after fluid management. The patient refused for referral outside our institute for echocardiogram. The patient was kept under observation with all needed emergency drugs for managing bradycardia. However, the patient was showing the pulse rate around 45–50 only but without any clinical symptoms of giddiness. The patient also gave a history of similar episode that was relieved in the morning hours last two nights. The patient was on tapering dose of tablet prednisolone 5 mg OD and was started with increased dose drug of capsule thalidomide 300 mg 2 days before this episode. Since there were reports on thalidomide-induced bradycardia as shown in [Table 2], we felt that this symptomatic bradycardia is due to thalidomide. Hence, the dose of capsule thalidomide was reduced to 200 mg [Table 3] with an increased dose of tablet prednisolone to 15 mg OD for controlling the symptoms of ENL. The patient was observed for 2 days with reduced dose of thalidomide. After 2 days, a repeat ECG was taken and it shows improvement in the rate. Hence, the dosage of capsule TLD is further reduced to 100 mg [Table 3] with same dose of prednisolone. ECG showed normalization of rate of ECG with sinus rhythm and rate. Due to previous reports of thalidomide-associated bradycardia, we strongly suspect that thalidomide is the causative agent in bradycardia in this patient. This is the first case report where the indication for thalidomide is use in leprosy-related complication namely ENL. Furthermore, this is the first case report where bradycardia is seen in young adult where there was no other bradycardia causing co-drugs administered. The supposed mechanism in causing bradycardia is that the nucleus of vagal nerve is rapidly and completely inhibited by exposure to TNF-α. One of the actions of thalidomide is that it inhibits TNF-α expression and activity and this could lead to unmasking and overactivity of the parasympathetic system and induction of bradycardia. It is also shown in clinical trials and various postmarketing surveillances; the incidence of thalidomide-related severe bradycardia causing syncope or hypotension is low with 1%–3% of that pacemaker may be needed and mild bradycardia accounts for 25%–50%. In ENL, treatment with thalidomide should be initiated as per the indication and the severity of reaction. The maximal permissible dose of thalidomide is 400 mg/day. However, in most of the clinical setup, it is 300 mg/day for severe reaction without neuritis. The maximum dose was given at bed time to minimize somnolence and fatigue. As per the response to the treatment and improvement in clinical symptoms, capsule can be reduced by 50 mg/day every 15 days once or as the patients need. The maximum duration varies from patients to patients; however, in most of the clinical setup in leprosy, it varies from 3 to 6 months. The dose should be administered as per the categorization of severity. It was found in clinical setup in leprosy and from other studies; patients receiving daily doses of 100 mg or less seem to tolerate the treatment well with few side effects. The side effects are increased with increase in dosage from 100 mg/day. Thalidomide is usually administered at bedtime in our patient with thalidomide to an initial dose of 100 mg/day, the heart rate found normal. However, because of no response to 100 mg, the patient was started approved maximal dose of 300 mg per day that resulted in intermittent symptoms of lightheadedness and dizziness. Thalidomide-induced bradycardia appears to be an important adverse effect, particularly in patients with maximal dosage of 300 mg/day in our patient. Therefore, providers in leprosy should monitor these patients closely for signs and symptoms of bradycardia during the administration of thalidomide in ENL cases. Bradycardia was reverted to normal by a reduction in dose or discontinuation of thalidomide, suggesting a reversible effect on sinus node function. Here, in our case, thalidomide cannot be stopped for reason of ongoing reactions. Lockwood DN. The management of erythema nodosum leprosum: Current and future options. Lepr Rev 1996;67:253-9. Pocaterra L, Jain S, Reddy R, Muzaffarullah S, Torres O, Suneetha S, et al. Clinical course of erythema nodosum leprosum: An 11-year cohort study in Hyderabad, India. Am J Trop Med Hyg 2006;74:868-79. Helmy HS, Pearson JM, Waters MF. Treatment of moderately severe erythema nodosum leprosum with clofazimine – A controlled trial. Lepr Rev 1971;42:167-77. Tadesse A, Abebe M, Bizuneh E, Mulugeta W, Aseffa A, Shannon EJ, et al. Effect of thalidomide on the expression of TNF-alpha m-RNA and synthesis of TNF-alpha in cells from leprosy patients with reversal reaction. Immunopharmacol Immunotoxicol 2006;28:431-41. Kaur A, Yu SS, Lee AJ, Chiao TB. Thalidomide-induced sinus bradycardia. Ann Pharmacother 2003;37:1040-3. Tseng CH, Su YJ, Lai YC. Thalidomide-induced bradycardia in an old man. Int J Gerontol 2010;4:197-8. Yamaguchi T. Syncope and sinus bradycardia from combined use of thalidomide and beta-blocker. Pharmacoepidemiol Drug Saf 2008;17:1033-5. Shanbhag PS, Viswanath V, Torsekar RG. Thalidomide: Current status. Indian J Dermatol Venereol Leprol 2006;72:75-80. Ghobrial IM, Rajkumar SV. Management of thalidomide toxicity. J Support Oncol 2003;1:194-205. Dimopoulos MA, Eleutherakis-Papaiakovou V. Adverse effects of thalidomide administration in patients with neoplastic diseases. Am J Med 2004;117:508-15.